This is called a “Seeded Spelt Roll” and appears to be what I had been sent. Now, in the picker’s defense, I could understand not knowing what Malt or Spelt meant. However, if I did not know, I would look it up or ask the people in the bakery department. It’s not a huge problem, I just refused the item and had it sent back. It did mea I was out some rolls for my Lunch, though. But the biggest problem from yesterday was the driver forgetting an entire tray of chilled foods, including milk. The total amount missing was Â£14.62, which is a pretty decent chunk of our weekly groceries, considering this was all of our dairy products (milk, butter, yoghurt, cheese) and salad items (lettuce, tomato, spinach, mushrooms). The driver couldn’t bring me the items but he was going to see if an afternoon van had space. Unfortunately, the afternoon and evening vans didn’t, and my only option was if his supervisor was *willing* to bring me my missing items in the afternoon. Like I said on Facebook, we live nearly an hour away from the grocery depot, so I couldn’t imagine the supervisor being willing to take over two hours out of his day to do this. When I received no call back, I rang up customer service and got a lovely woman named Tammy (wish I knew her last name!) who rang the store while I was on hold and unfortunately came back to tell me I wasn’t getting the items yesterday and was going to get a refund for those items. BUT, Tammy would put in an order for the missing items with a delivery for today, refund the delivery charge, and send me a voucher for the trouble it caused me. When I spoke with Tesco on Facebook, they also decided to give me a voucher as an apology for all the confusion this has caused. You’d think that would be the end, right? Items would arrive, all would be well….you’d think wrong. Tesco driver, Ashley, rang to tell me he was running late and would not be delivering my groceries until 10:30. I immediately contacted Tesco through facebook again to tell them, and I was offered another voucher for the problem. When my order arrived…guess what? THEY SENT THE WRONG ROLLS AGAIN!! I was annoyed, but what puzzled me more was the grocery total. Â£25.32 when it should have been at the most Â£19.46. What happened? OH, apparently several of the items I had ordered were on a special offer that had expired yesterday. Fortunately, another phone call, this time speaking to a man named Alister, fixed the problem and got the delivery charge refunded. In the end, Tesco sent me Â£30 in vouchers, plus refunded delivery charges. I think this is above and beyond anything I expected and I truly thank Tesco…because honestly? It’s the Â£30 in vouchers that is going to keep me a customer. Knowing that Tesco cares about their customers enough to go the extra mile is what will keep me coming back. Thank you, Tesco. Thank you Jamie, Tammy, and Alister. But could you teach the pickers in Cleethorpes what Malt rolls look like? I’m debating about adding onto the sheet all times we go shopping for toiletries (boots/wilkos/etc), as I am interested in knowing what we spend on those things. I might still have my receipts from this month, or I can price things out individually and work out the total. It was less than Â£25, but more than usual because we ran out of everything this month including Tim’s aftershave. Still, Â£173 isn’t bad. We’ve always aimed to spend less than Â£200. And yesterday was the most expensive delivery because we defrosted the freezer and needed to restock it. Paying for delivery annoys me sometimes, but I can justify it, easily. If Tim isn’t available to drive me to the shop, I’d have to take a bus at Â£4.80 Return. Delivery fees hover between Â£3.50 and Â£4.50, depending on how fast I book it. Petrol would be negligible, since we live fairly close to most of the shops (though I bet Asda would be more in petrol than the delivery fee), but when you think about how much time you spend in the grocery stores…..the delivery fee is well worth it! Here’s hoping I can do better in February, though. Ideally, I’d rather groceries be down in the Â£125-150 range for the month, especially since we will have houseguests in April and May that will add extras! (Dear houseguests: No, I am not asking you to buy groceries while you are here! Stop thinking that!!). We also are going on holiday in June, so groceries become a little iffy then, too. Even with camping, we still wind up doing a daily shop and it can add up since you never have a stocked pantry to work with. I need a new iron. The one I have been using was Tim’s from bachelordom and he no longer has the manual for it ,nor can one be located online. Plus, I wanted an iron with the ability to steam upright. After loads of looking online, I settled on a Morphy Richard’s model and ordered it from Tesco Direct (mostly for the points!). 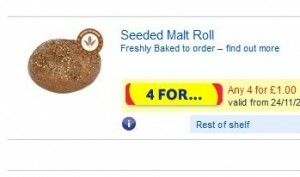 Tesco has two delivery options – The first was Â£5 (or was it Â£3?) and was for a 12-hour slot of 7am to 7pm. The second option was Â£6.85 and lets you pick your own 2 hour time slot for delivery. I paid the extra and set my delivery for today from 3pm to 5pm. I’m writing this at 5:57, and there still is no sign of my iron. I rang Tesco around ten past five because I checked the online status and it says my item is going from the warehouse to the store, NOT out for delivery. The woman I spoke with was very nice. She said it should be out for delivery and she didn’t know why it hadn’t arrived yet, so could I hold on while she rang the store it was coming from (Cleethorpes). I waited, and she came back on the line to tell me that no one was answering the phone in the delivery department, but she spoke to store customer service who told her that was because they were done for the day, and the store had no way of contacting the driver. This is a bunch of crap, as they have always been able to ring the driver if he was running late — and on several occasions, the driver has rung me to tell me he was running late. The only thing the woman could tell me was to wait until 7PM and ring back tonight or tomorrow morning to reschedule delivery, but she would refund my $6.85. I told her I was not interested in rescheduling my delivery because I would not be available tomorrow, I was available today from 3 to 5, which was why I paid extra to book the slot. She urged me to wait until 7PM just in case the driver was running late. In the meantime, I’ve found the exact same iron at Argos. It is Â£7 more than Tesco but it will even itself out because Tim can collect the item before work tomorrow and we can avoid a delivery fees. For whatever reason, Tesco Direct will not send items to Lincoln, and always insists we need to pick things up in Cleethorpes, which for those of you who don’t know, is about a half hour to 45 minute drive away from us! Overall, I’m very disappointed with Tesco today. There is absolutely no excuse for not delivering an item on time, let alone not ringing to state it will not be on time. I seriously doubt there was ever an iron on the delivery van for me for today, given the online status of my order, too. In the US, a new show on TLC has been raising eyebrows everywhere called Extreme Couponing. I’ll link to one of the blurbs for an episode below, but you can very easily search for Extreme Couponing on YouTube and pull up loads more clips, including personal videos by some of the people on the show where they give extensive “tours” of their stockpiles. If I linked to every single YouTube video I’ve watched, it would be a very long list. The show isn’t available in the UK (or if it is, it’s not on the channels I get), so I have to watch the segments on YouTube. The show has been also raising eyebrows all over the blogosphere, too (yes, those are all separate links). Lots of legitimate couponing sites (again, google for more) have been blasting the show’s policies, including the people on the show using coupons for the wrong items in order to lower their bill. The idea behind the show is to save as much money as you can on your grocery bill, by ANY means possible, even if it means buying coupons online for $70 or dumpster diving for discarded coupon inserts. I love saving money as much as anyone else, but there’s a reason the show is called “extreme”! In the UK, couponing isn’t a big deal. Every once in a while there might be a coupon for something in a magazine or through the post, but there are no Sunday inserts — most of the grocery stores don’t even put out weekly fliers. But every time you walk around one of the shops with your grocery list, you’re bound to find at least half of the items on your list on special offer, and if you are really pressed for funds, you can purchase things off of the ultra-value line, where cans of soup cost 17p. I get a little thrill when our total is shown as Â£58 and then the cashier scans our clubcard and the total gets reduced to Â£35. A few weeks back, Tim and I went to Tesco armed with Â£9.50 in clubcard vouchers and whatever loose change we had in our pockets (well, and our debit cards). We set ourselves a goal of spending as close to Â£10 as we could. As you can see, we spent Â£1.49 out of pocket. I consider this an awesome shopping trip, but was it extreme? No, probably not. For one, we didn’t deliberately buy things just to get them “for free”, and in fact we added the Red Leicester cheese and the Lighter Cheese (on an offer 2/Â£3) just so we would definitely spend more than our vouchers. All of the above items came from Tesco’s “value” range. The jar of chocolate hazelnut was larger than the largest jar of Nutella and the Nutella was over Â£3. Fortunately, we had tried the Tesco brand before, and actually like it. I can’t tell a difference at all between it and Nutella. And it’s less than Â£1. Sparkling water? Sure, I could have gone for one of the brands, but in my opinion, water is water. I’m going to pour it into a glass and top it off with some fruit squash, so does it really matter? The same with the pineapple – it’s an ingredient in another recipe. The value tin came in syrup instead of juice, but I’ll rinse off the pineapple before I use it. The bread probably wasn’t the greatest. It’s really thin slices of bread, but it doesn’t taste bad. Granted, on a regular shopping trip, we probably would have picked up Nutella, Buxton brand water, and Kingsmill bread, but we were deliberately trying to see what we could get for approximately Â£10 and I wanted to try out some of the Tesco value line products. What I learned? The value products really aren’t bad. And if it means I spend only Â£20 on weekly groceries, I’ll take it. I don’t get homesick. Honestly. But I do on occasion miss things from the US, and it gives me something to experiment with in the kitchen when what I miss is food. For ages, a friend of mine kept telling me I could get something similar to Steak-Ums* at Iceland**, but I never spotted them, so I had kind of given up on the idea of trying to make a cheesesteak sandwich. But last week, I really wanted a chicken cheesesteak hoagie (sometimes also called a California chicken cheesesteak). I could practically taste it, I wanted one so badly. When is a cheesesteak a hoagie? When you add onto it mayonnaise, lettuce, and tomato (sometimes also oregano and pickles, depending on the shop). Now, some people will argue that chicken does not belong on a cheesesteak. To them I stick out my tongue. I have never been a fan of beef, being unable to properly digest it most of the time, so I tend to avoid it (I even was vegetarian for many years because of my dislike of meat, too). Last week, I ordered an item from Tesco called “pork for stir-fry”. It turned out to be small strips of pork, so I thought if I bought chicken for stir-fry, it would hopefully be the same style. I checked the Tesco website, and it isn’t. Chicken for stir-fry comes as cubes, not strips. Back to the drawing board for ideas. My second thought was to order some “mini fillets” – if I pounded them down a bit flatter I thought it just might work. I even went so far as to wonder if sliced chicken lunchmeat would work! But then, I was at ASDA on Saturday with my MIL and SIL and in the poultry section they had something called “turkey steaks”. I know, I know “steak is supposed to be beef”. But the package looked interesting, and the “steaks” looked the same way regular steak looks, just made of turkey. I thought I’d give it a go and purchased 2 submarine rolls along with lettuce and tomato. Don’t ask me what kind of cheese I used, though. I have a big block I got on offer at Tesco a few weeks ago that I just keep shredding whenever something calls for cheese. Sadly, no Cheeze Whiz (though I understand it is available in some ASDA stores). Today was the day. I was going to attempt this, and if it didn’t work, Tim and I would be screwed for Lunch. I decided to grill the steaks on the George Foreman. There wasn’t much fat in them to begin with, but I just like the way things come out on the George. The steaks only took about 8 minutes. I wound up slicing the steaks (though not nearly as chopped up as an authentic cheesesteak) so they would fit easier in the rolls. Topped the steaks with a small bit of shredded cheese, lettuce, tomato, and a small sprinkling of cheese, then put them under the grill*** (the regular oven’s grill) until the cheese was melted and the bread was toasty. Sadly, no photo. I thought about it after I was almost done the sandwich! *Steak-Ums, for those of you unfamiliar with them are very thin bits of steak you grill or fry and then put in a sandwich to make a homemade steak sandwich. **No, not the country. There is a shop called Iceland that primarily sells inexpensive frozen items. ***In the US, I would use the broiler.